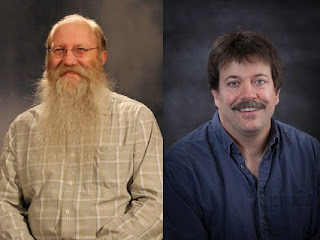 The School of Natural Resources and Extension has promoted two professors. Dave Valentine has been named director of academic programs, and Milan Shipka will become director of research and the Agricultural and Forestry Experiment Station. The half-time administrative appointments are effective July 1, 2015. The university created the positions following the announced departure of Interim Dean and Director Stephen Sparrow, who will retire June 30. Both positions will report to Fred Schlutt, the vice provost for outreach and Extension. Valentine will direct and evaluate the school’s academic programs, and Shipka will oversee the faculty research programs and work with faculty to develop a long-term strategy for research. Both professors will continue to teach and conduct research, and Shipka will work with Extension. Sparrow is pleased that Dave and Milan have agreed to their new roles. “Based on their wide work experience inside and outside the school, they are highly qualified for these positions,” he said. Valentine, a forestry soils professor, has taught at university since 1996. He earned a doctorate from Duke University in 1990. Shipka, a professor of animal science and Extension livestock specialist, has been with the university since 1999 and earned a doctorate from Utah State University in 1996.